ned by the class of subrings of a class of endomorphism rings of abelian groups and is therefore strict. Not every strict radical is of this type, and while the A-radicals are of this type, there are others, including some special radicals. These investigations bring radical theory into contact with (at least) two questions from other parts of algebra. 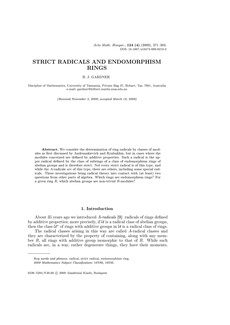 Which rings are endomorphism rings? For a given ring R, which abelian groups are non-trivial R-modules?